WEST LOOP — It's like the Redbox of dry cleaning. 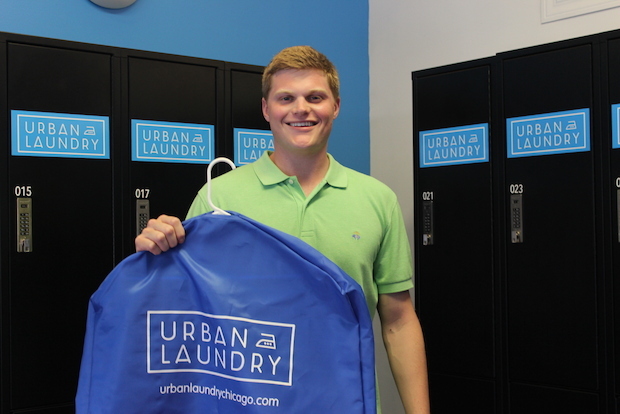 That's how Urban Laundry co-founder George Mack describes the new West Loop shop he opened with his dad — a service that allows customers to leave their laundry or dry cleaning in lockers and pay using the company's app. "Nowadays, everybody just wants everything on demand. So it's kind of like what Redbox did for movies. That's kind of like what we're trying to do for laundry, Mack said. Mack and his dad, George Mack Sr., based their company off Laundry Locker, a San Francisco dry cleaner that pioneered the locker concept in 2005. Urban Laundry opened in January at 1167 W. Madison St. Now that winter is over, the younger Mack said they've had more people come in asking questions about the shop's black lockers. Here's how it works: Customers drop off their cleaning in an open locker and text the locker number to place their order. The clothing is then sent out to a third-party cleaner. Finally, customers are notified when their order is ready via the company's smartphone app or text message and return to a locker to pick up their clean laundry. Urban Laundry also keeps photos of all laundry, allowing customers to highlight clothing in need of repair. "It's an innovation in an industry that's really seen none in a long time," said Mack. In addition to dry cleaning, Urban Laundry offers shoe repairs and shines, and cleans, folds and wraps laundry. Prices range from $1.50 per pound for the laundry service (with a 10 pound minimum) to $4 for a dry cleaned shirt. A shoe shine is $10.